1. Bring 2 quarts of water to a boil and add 3 tablespoons of lobster base. Whisk until combined and turn off heat. 2. Combine 9 ounces of butter and flour in a stockpot over medium heat while whisking together. Cook roux until dark blond stage. This will take about 45 min. over medium low heat stirring the entire time! Roux will burn quickly! 3. While cooking the roux, sauté the onions, celery, carrots, garlic, and shallots over medium heat for about 10 minutes. 4. Deglaze this pan with the ¼ cup of white wine. Cook for 1-2 more min. and remove from heat. 5. After roux has reached its dark blonde state begin to add the 2 quarts of hot stock in batches of 4 (2 cups at a time), whisking the entire time to prevent lumps. 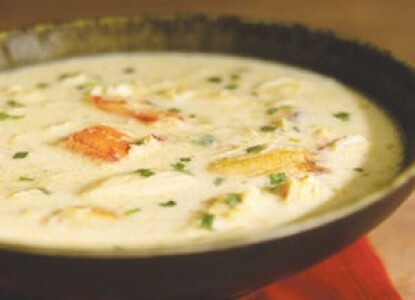 Once all the stock is incorporated whisk in the heavy cream, crab meat, and sautéed vegetables. 6. Add 2 tablespoons of Old Bay and a few cracks of fresh black pepper.